Black or White colors and as soft as a cloud. A super resilient closed cell polymeric sponge base provides exceptional bouyancy to reduce fatigue plus a non-skid pyramid surface for the toughest environments. Permanently bonded to your choice of a 3/8” or 3/4” resilient closed cell polymeric sponge base, overall thickness is 1/2” (Single Sponge) or 7/8” (Double Sponge). Two year conditional-non-prorated warranty insures against cracking or fracturing. 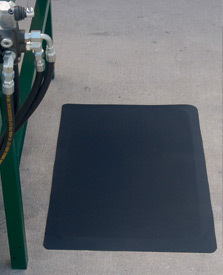 The Pyra-Mat Anti-Fatigue Mats is designed to provide excellent traction while being aesthetically pleasing. The unique pyramid design comes in either Black or White colors with your choice of 1/2″ thick single sponge or 7/8″ thick double sponge for maximum comfort! Custom sizes available in 2', 3' and 4' widths up to 75' long. Call 1-800-810-7847 or email service@commercialmatsandrubber.comfor custom size pricing! Colors: Black, White 7/8" Thick / Double Sponge (DS); Square edges available upon request, No Charge. Custom configurations available, fax drawing for quote. ALSO AVAILABLE WITH RHI-NO-SLIP ANTI-FATIGUE FOAM.